Started showing symptoms on October 11, 2014. 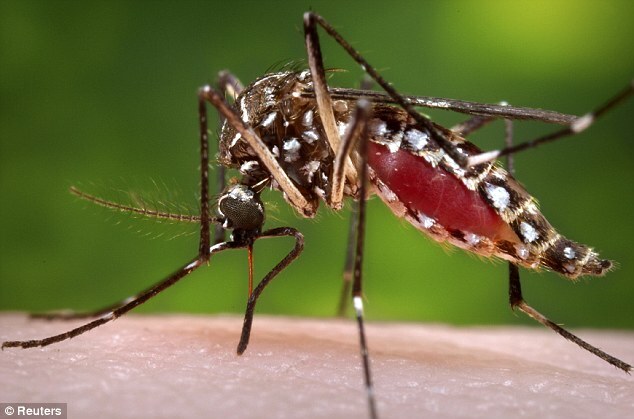 After researching, I discovered that the infected mosquitos like to be closer to the forest than by the ocean (where I worked and lived). With that information, I assumed I was infected the week before when I had a friend visiting me in Puerto Rico. We traveled to El Yunque Rainforest, went zip-lining in Toro Verde, and also went to Oktobeerfest which was close to Toro Verde up in the mountains as well. My first symptom was red spots all over my body on October 10th. I thought that I had gotten a rash from something in the ocean… it was very strange. It didn’t itch or anything though. The next day I woke up with severe joint pain, a fever, and felt very nauseous. I almost fainted when I got out of bed, and I could barely walk 4 feet to my bathroom my joints hurt so badly. I still went to work, walked an hour to get there along the beach. I didn’t have a car in Puerto Rico, and my boss was out of town who usually was able to give me rides, so I knew the only way I could get to the hospital was for someone from security at the Ritz to take me. 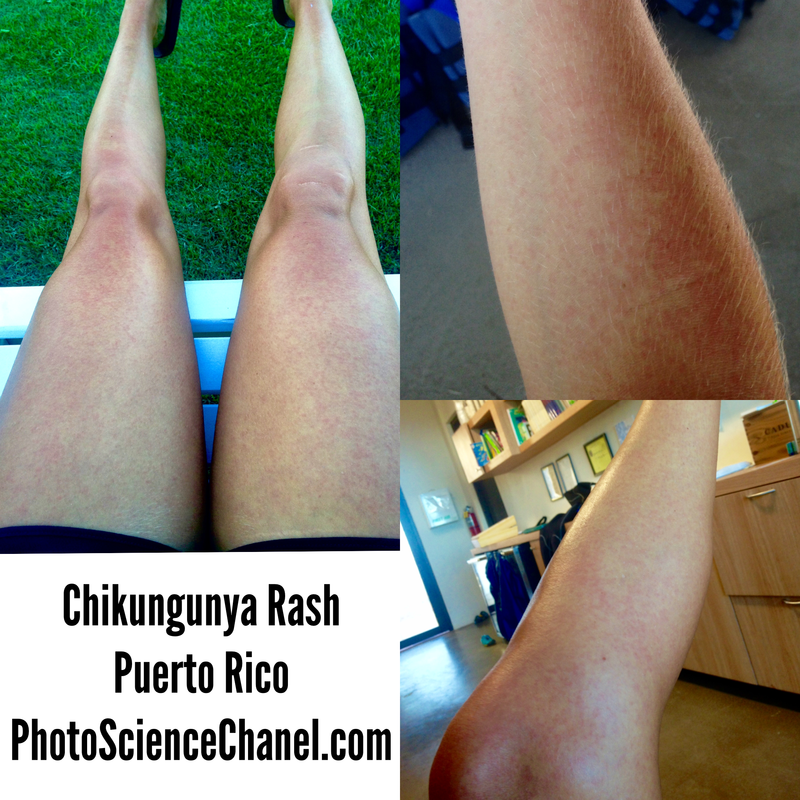 When I finally got to the hospital, I got my blood drawn and a shot in my tush and spoke with the doctor who said it looked like I had Chikungunya, or it could be Dengue. He wasn’t too helpful to be honest. The rash came back with vengeance over the next couple of days. It covered my whole body – and some extremely itchy no matter what anti-itch ointment was used. VERY IRRITATING especially paired up with the severe joint pain in my knees, ankle, foot joints as well as my shoulders, elbows, wrists, and finger joints. I honestly couldn’t lift a glass of water sometimes, or open a door handle, or even walk without holding on to something to keep me up. I decided to go to a different emergency care facility to get help for the rash. The doctor there was much more helpful, and after blood tests she confirmed that it was Chikungunya and then prescribed me some drugs for my stomach and the joint pain. Apparently, the virus has some affects on your stomach, even though I didn’t really have any, I took the meds just in case. She didn’t prescribe anything for the rash – just said to pick up Benadryl from the pharmacy (which still didn’t work). Doctors orders were rest at home and drink lots of fluids for a week before I could go back to work. The joint pain has been constant for the last 3 months. The pain was worse in the mornings, sometimes it affected my sleeping habits. Chikungunya can stay in your system for up to 2 years, so I was really crossing my fingers that I wouldn’t have this pain for that long. I am a very active person, so this has been a very difficult process for me. As I enter my 4th month (February 2015) with the virus, the only joint pain I still get are in some of my finger/hand joints when I wake up in the morning. The pain usually dissipates throughout the day though, which is good. I am able to start working out again – short runs and yoga – and not be in pain.